tons of toons: Boat or Die Ya Wimp!!! I have always liked the Marvel Superheroes. I have liked Marvel artwork too. I was first introduced to Spiderman back in 1964 when I was at Camp Longhorn in Burnett, Texas. When I was at Cal, Captain Marvel moved up with Spiderman as my favorite superhero. Man, he saved the cosmos sooooo many times!!! 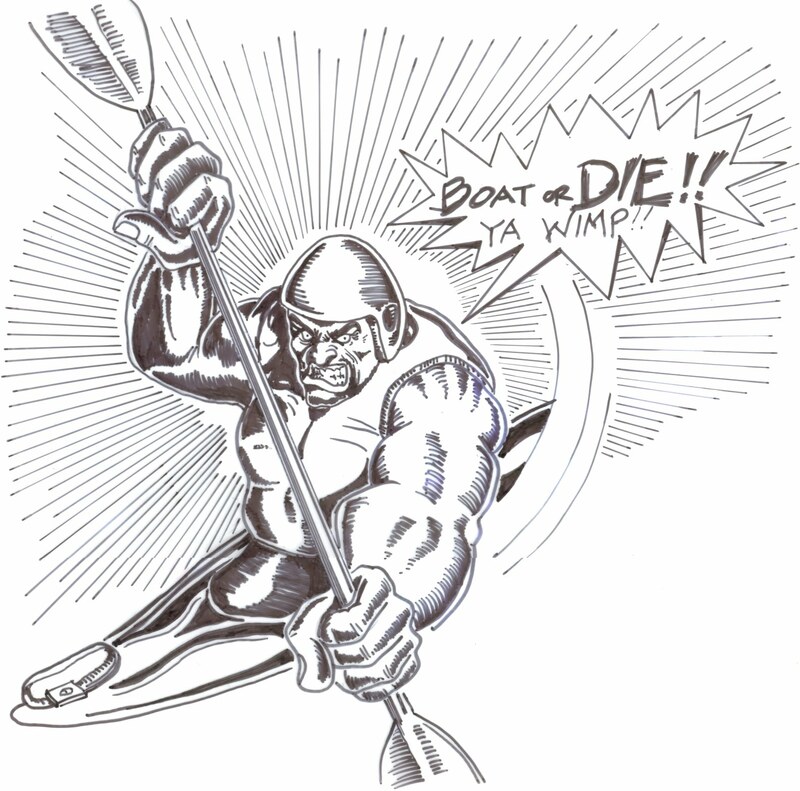 So, this drawing was a T-shirt graphic for the second annual Riverhouse Rendezvous 1996, a local kayak slalom race I was organizing for about 7 years. My favorite part of that was designing the T-shirts. (more T-shirt graphics to come) So, this guy here was modelled after one of the supervillains from a Marvel Comic. I think it was Juggernaut, but I can't be sure. 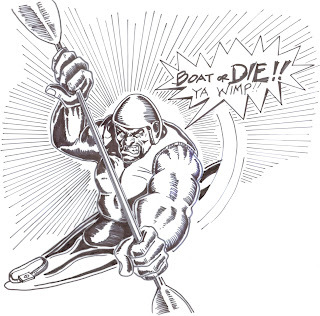 Anyway, his face, and arm position were perfect to mimic a kayaker. Leg position didn't matter, because I poured him into this tiny kayak. So far out of proportion that it is obvious that the kayak is a part of his own body. He is also a ferocious competitor. You can tell by his expression!! I call him "Kaptain Kollosus Kayaker"!!! This was always my favorite T-shirt design. Are there any left? If not, you should order a re-print. You should take orders for Christmas! This was a slight departure from your usual style, but turned out well. I think I still have my T-Shirt around somewhere. I will have to look.